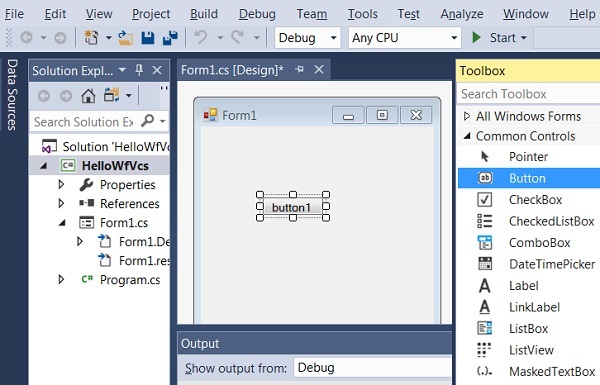 How to build a Windows Forms application with VC# code in Visual Studio 2017? 1. Click "File > New > Project" menu. You see the new project box showing up. 4. Click "OK". You see a default application form displayed on the visual design section showing up. 5. Drag the bottom right corner to change the size of the application form. 6. Drag and drop any form controls from the Toolbox. 7. Open the Form1.vb code to enter your VB coding. 8. Click "Build > Build Solution" to build the application.